Xmas Eve. 9:P.M. Camp Ronde Fontaine, Near Verdun, France. This “day-before-Xmas” has been one ideal day and evening for the occasion. The day has been filled with warmth and beautiful sunshine, such as we seldom see now-a-days for the continual rain and gloom. About an hour ago it started snowing beautiful big flakes and now the earth is covered with a white blanket to the depth of at least two inches. Surely this day has been made as per the Order. At the rear echelon to-nite the theatrical talent of “E” and “F” Batteries are stageing a minstrel show in the Y.M.C.A. Hut for the benefit of the boys in the 130 F.A. Having had a spell of 9 days of pleasure and amusement I didn’t care much about going down. I remember two-years ago to nite quite well. Close of contest at J.W.’s (1). We have our mess hall decorated very attractively with evergreen, wild red cherries, and mistletoe and will also have the Regtl. [Regimental] Colors among the decorations to-morrow. There is certainly fine material in the two flags, value $800. Am going to send you and J.W. each a small cigar box filled with these decorations to-morrow. The mistletoe was gathered on that undesirable soil which layed between the French and German Front-line Trenches, better known as “No-Man’s-Land” near Haudemont, 15 miles south east from “Battle-torn” Verdun. To-morrow, (Christmas) is my day on duty and I will have the honor of serving champagne galore, a big 14lb. turkey costing $1.01 per lb., or practically a $15.00 bird, and all the usual Christmas dishes. Our officers and boys from this little Camp had a wild-boar drive last Sunday but returned without capturing any of the many young pigs which are so plentiful here in these woods. And deer too, quite often they are seen. Yesterday there were three in Camp, but our Col. would not permit us to kill them, as they are protected by the French Game Law. 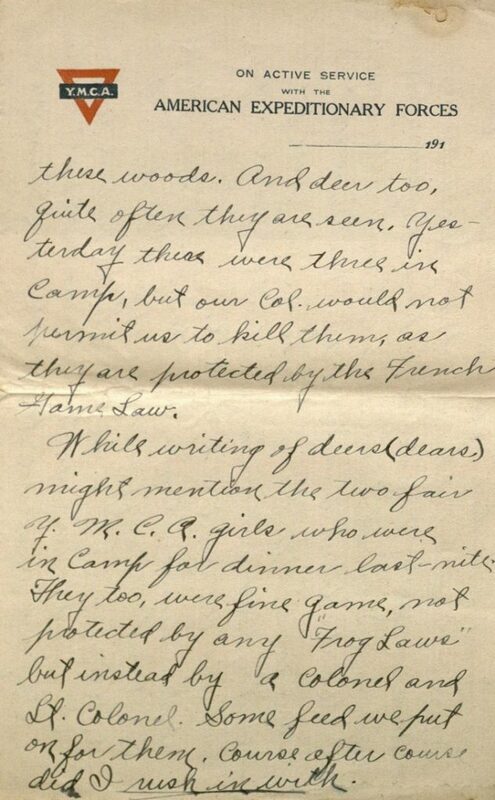 While writing of deers (dears) might mention the two fair Y.M.C.A. girls who were in camp for dinner last-nite. They too, were fine game, not protected by any “Frog Laws” but instead by a Colonel and Lt. Colonel. Some feed we put on for them. Course after course did I rush in with. I spent Sunday afternoon visiting the “Argonia Bunch. Saw Roy Hall (2), Geo. Lukens (3), Chris Jurgens (4), Merle Phillipi (5) and Alvin Warlow (6) and I found them all well and “getting by” with out doing much duty. We have not heard from Geo. 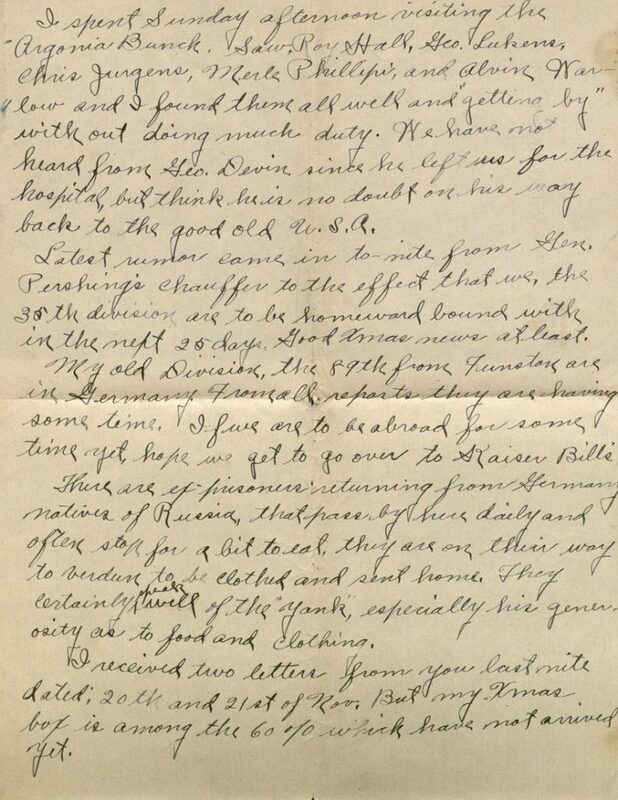 Devin (7) since he left us for the hospital, but I think he is no doubt on his way back to the good old U.S.A.
Latest rumor came in to-nite from Gen. Pershing’s Chauffer to the effect that we, the 35th division are to be homeward bound with in the next 25 days. Good Xmas news at least. My old Division, the 89th from Funston are in Germany. From all reports they are having some time. If we are to be abroad for some time yet, hope we get to go over to Kaiser Bill’s. There are ex-prisoners returning from Germany, natives of Russia, that pass by here daily and often stop for a bit to eat, they are on their way to Verdun to be clothed and sent home. They certainly speak well of the “Yank,” especially his generosity as to food and clothing. I received two letters from you last nite dated; 20th and 21st of Nov. But my Xmas box is among the 60% which have not arrived yet. 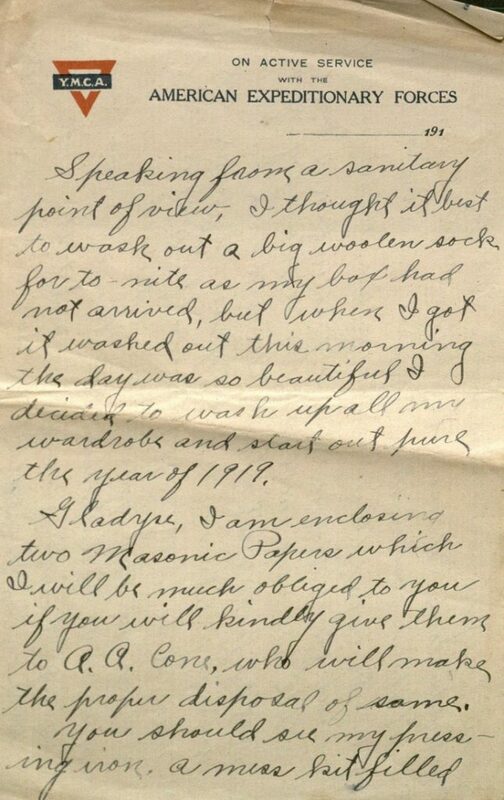 Speaking from a sanitary point of view, I thought it best to wash out a big woolen sock, for to-nite as my box had not arrived, but when I got it washed out this morning the day was so beautiful I decided to wash up all my wardrobe and start out pure the year of 1919. Gladyse, I am enclosing two Masonic Papers which I will be much obliged to you if you will kindly give them to A.A. Cone (8), who will make the proper disposal of same. 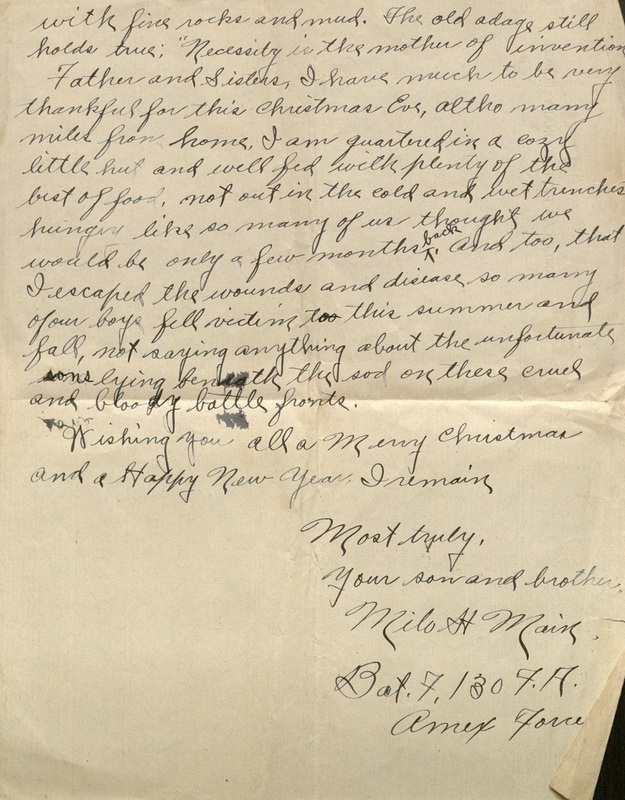 Father and Sisters, I have much to be very thankful for this Christmas Eve, altho many miles from home, I am quartered in a cozy little hut and well fed with plenty of the best of food, not out in the cold and wet trenches hungry like so many of us thought we would be only a few months back. And too, that I escaped the wounds and disease so many of our boys fell victim too this summer and fall, not saying anything about the unfortunate sons lying beneath the sod on these cruel and bloody battle fronts. (1) Probably J. W. Achelpohl, a storeowner in Argonia who was Milo’s former employer when he worked as a clerk. He has been mentioned in some of Milo’s previous letters. (2) According to his World War I draft registration card, Roy Lee Hall was born in Missouri on September 7, 1894. In 1917 he was working as a laborer in Argonia. During the war he served in Headquarters Detachment, 60th Field Artillery Brigade. (3) According to his World War I draft registration card, George Willard Lukens was born in Missouri on July 13, 1889. Argonia is listed as his home address, but in June 1917 he was working as a bricklayer in nearby Harper, Kansas. According to Army transport passenger lists, Lukens served in Battery A, 130th Field Artillery. (4) Milo previously mentioned Chris Jurgens in his letter of August 11th. Biographical information about him can be found in that blog post. (5) Murrell Lewis Phillippi, who Milo has mentioned previously. 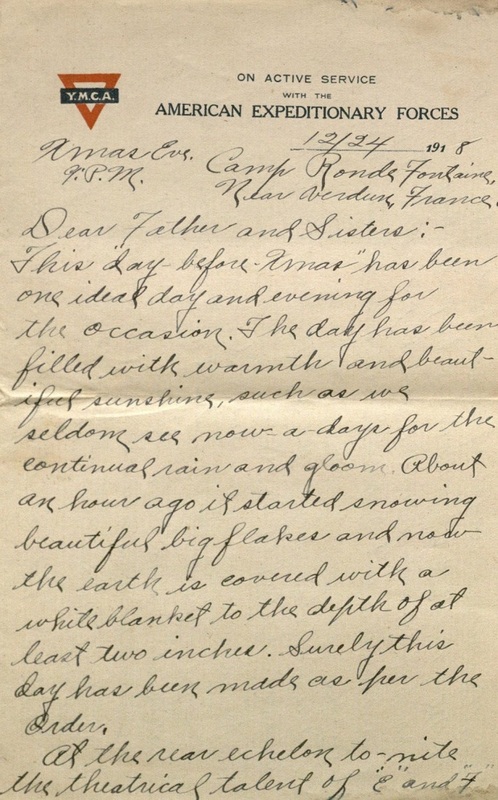 Biographical information about him can be found with Milo’s letter of August 11. (6) Alvin Lee Warlow, who Milo has mentioned previously. Biographical information about him can be found with Milo’s letter of October 9th. (7) According to his World War I draft registration card, Kansas native George Franklin Devins was born on September 8, 1889. In 1917, he was farming in Argonia. George served with Milo in Battery F, 130th Field Artillery. He was apparently in the hospital suffering from shell shock received from a high-explosive shell during the Battle of the Argonne Forest. (8) Possibly Ashley A. Cone. Cone was born in Ohio in 1870, although his family relocated to Sumner County by the time he was ten years old. Cone worked as a mail carrier. He was previously mentioned in Milo’s letter of October 24th. Camp Ronde Fontaine, near Verdun, Frce. 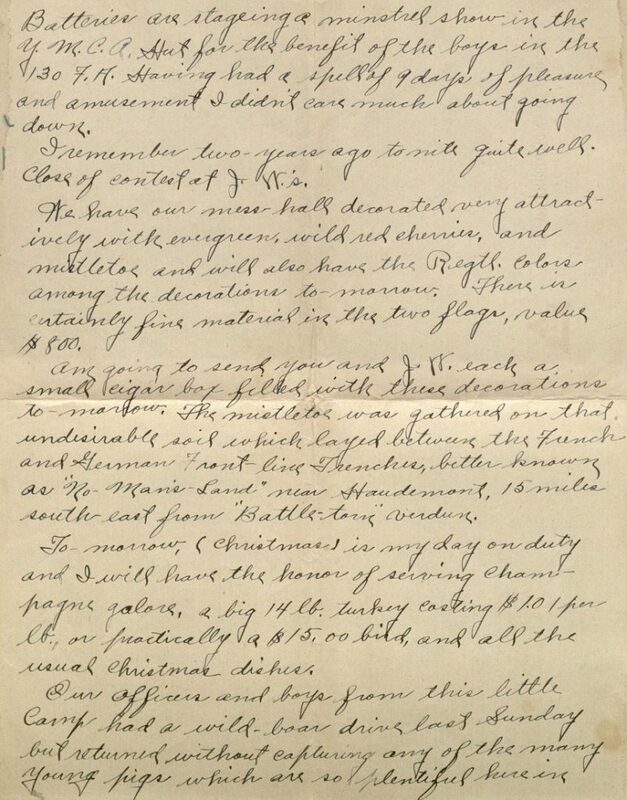 Dear Father and Sisters:- Have a letter from June and Gladyse, both dated Nov 30th. Have not received my Xmas box yet, but about 60% of the boys are in the same straits. Aunt Nan (1) was wrong about being on way home. I too, were mistaken. But at present all rumors are to the effect of our departure from this warring land not later than Jan. 25th. We move from our present position to rear to a little city of Some-Due. We will occupy a Chateau formerly the quarters of French Generals during the war. Will tell you all about it when we get moved. This morning I mailed you and J.W. each a small cigar box filled with mistletoe, hemlock, and wild red French forest berries which we gathered in “No-mans-land near Haudemont for decorating our Mess Hall for our 6 o’clock Xmas dinner. Certainly had a beautiful table and room that night. Big American Turkey at $1.01 per lb was the guest of honor. The night before Xmas it started snowing and never ceased until the day after Xmas. A more beautiful Xmas, I have never seen. No wind, and snow piled up on the tree branches 3/4 of an inch deep. It was one of those Washington snows like we read about. But now it is raining again. The ground has only been frozen a bit on one occasion. Just paper[ed] my corner of our little home with late Saturday Evening posts and made me coat and Shirt hangers galore and too, I promoted a bunch of fresh hay for feathers, (had a new bed + sack). But am to take every thing when we move. Wish you could see my little home. I have now learned how to brighten the corner where you are and keep up clothes up off the floor and out of the corners as I used to do at home. All the Argonians are well, except Geo Devin and he never writes from hospital. Tell June not to buy me a lounging robe for if I reenlist I cannot use it. Just keep your change. Must close for this Saturday evening, as this is the physicological time for me to bathe. This is a hard life, work one day and rest one. My day off, slept until 8:30 A.M.
Am enclosing a Menu of our Xmas dinner and some pop bottle labels. I wrote J.W.A. a letter this P.M. He offered me a good proposition on my return to the States. He has been a keen fellow toward me I must say. May get some mail this evening. Will close for now, trusting all had a merry Christmas and wishing you a happy and prosperous New Year. (1) Preliminary research indicates this was Nancy Main, a younger sister of Milo’s father William. Nancy Main was born in 1869 and lived her entire life in Pike County, Illinois. The 1910 census lists her in the same household as Milo’s younger sister Fern. Milo previously mentioned his Aunt Nan in his letter of October 24th. This entry was posted on Monday, December 24th, 2018 at 8:00 am and is filed under Kansas Collection. You can skip to the end and leave a response. Pinging is currently not allowed.